A heart valve functions to prevent the backflow of blood to its chambers as the heart pumps to move blood forward to the circulation. 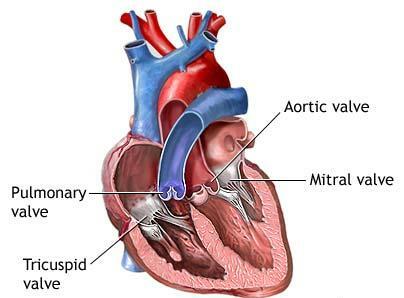 As the heart pumps blood from your left ventricle out to the large artery called aorta, the aortic valve, which guards the opening between them, opens and closes to prevent blood from leaking back into the ventricle. An aortic valve replacement surgery involves the removal of the damaged aortic valve, followed by its replacement with an artificial valve to restore normal heart function. When Is Aortic Valve Replacement Surgery Needed? Aortic stenosis occurs when the heart's valve becomes narrowed, thus obstructing blood flow from the heart into the aorta, and preventing the onward flow of blood to the rest of the body. Aortic stenosis makes the heart work harder, which eventually leads to weakness of the heart muscle. When left untreated, severe valve stenosis can lead to serious heart disease, so aortic valve replacement is necessary. Aortic regurgitation occurs when the valve does not close tightly after blood is pumped from the heart to the aorta. This allows some blood to leak back into the ventricle, thus preventing the heart from pumping blood efficiently to the rest of the body. This results in fatigue and shortness of breath. This condition may occur suddenly or it may develop over many years. Severe aortic regurgitation requires surgery to repair or replace the defective aortic valve. How Is Aortic Valve Replacement Surgery Carried Out? Aortic valve surgery may be done either through a minimally invasive surgery or through an open-heart surgery. The option of choosing to have minimally invasive surgery instead of open-heart surgery will depend on whether the doctor recommends it. If patients also need to have coronary artery bypass surgery, minimally invasive surgery may not be an option. A mechanical valve that is made of synthetic materials, such as carbon or titanium, which is longer lasting. However, patients will need to take warfarin or aspirin (blood-thinning medicines), for the rest of their lives if they get this type of valve. A biological valve, which is from animal or human tissue. This type of valve lasts for 10 to 20 years, but patients may not need to take blood-thinning drugs for life. Patients are taken to the ICU (intensive care unit) after an aortic valve replacement surgery, where they are closely monitored for 24 to 48 hours. An artificial breathing machine called a ventilator that helps move oxygenated air in and out of the lungs is attached through an endotracheal tube, into the mouth or nose. Patients wake up from surgery with the tube still in place, which may make them feel uncomfortable. They will not be able to eat, drink or talk. Once the patient is able to breathe on his own, the tube and the ventilator are removed and a mask is placed over the mouth and nose to resume oxygen supply. Some pain or discomfort may be expected after an aortic valve replacement surgery, as in other types of surgery. Patients are given painkillers after the anesthetic wears off. These may be continued at home, but pain and discomfort are likely to get better as the incision wounds heal. Patients are transferred from the ICU to the surgical ward when the doctors think they are ready. However, some patients may be moved to a high dependency unit if they need to be kept under close observation after the operation. A care team in the ward helps the patients get back on his diet and encourages them to get up as soon as possible. Depending on their progress, patients may be able to go home 7 to 10 days after the operation. Cardiac rehabilitation and physiotherapy are discussed before patients go home to help them quickly recover and prevent further heart problems. Recovery time after surgery depends on the patient’s age, overall health, and preoperative condition. Healing of the breastbone usually takes about 6 to 8 weeks, and it may take 2 to 3 months before patients feel completely well. If the surgeons used dissolvable stitches to close the wound, the wounds will disappear within 3 weeks. However, doctors may need to remove other stitch types during a follow-up appointment. When taking a bath, wash the wound using water and mild soap. Avoid using very hot water or soaking in the bath until the incision wound is healed. Avoid exposing the wound to sunlight during the first year after the surgery, because the scar may become darker if exposed to the sun.